Riverside High School students called for the release of Wildin Acosta outside Congressman G.K. Butterfield's Durham office. 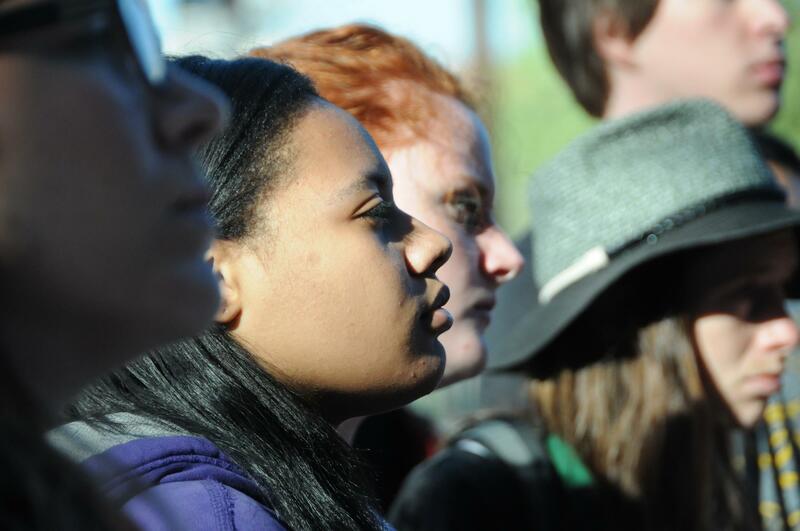 Friday, March 18, 2016—About a hundred students, teachers and community members gathered in downtown Durham Friday to call for the release of a Riverside High School student detained by Immigration and Customs Enforcement (ICE). 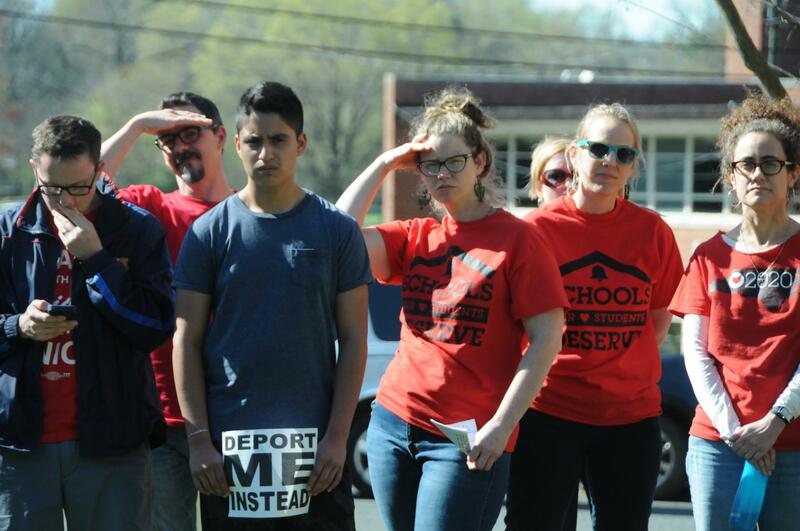 Jess Clark reports from downtown Durham, where students, teachers and community members called for the release of Riverside High School senior Wildin Acosta. Many of those at the rally had never met Wildin Acosta, the undocumented Riverside senior who has been held in detention since January. 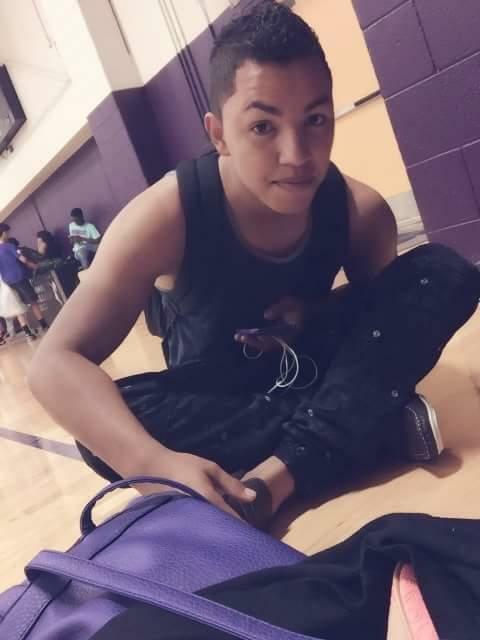 The nineteen-year-old was picked up on his way to school by Immigration and Customs Enforcement officers, or ICE officers. He is likely to be deported this weekend. But even if his classmates didn’t know him, they were outraged just the same. Riverside students, activists and community members gathered at Duke United Methodist Church and marched to Congressman Butterfield's office. "Among all the students right now, it’s like confusion as to why Wildin is being detained and possibly deported," said Morgan Whithaus, a senior at Riverside. "It just doesn’t make sense to many students...he’s a hard-working student. He has no criminal record." Whithaus was standing on the lawn of the Duke United Methodist Church amid a crowd of her classmates. All of them were wearing a tattered white scrap of fabric around their wrists. "We passed these out during our lunch period today, asking students to wear these in support for Wildin," Whithaus said. "There were classrooms full of students wearing these." Wildin Acosta crossed the border illegally two years ago from Honduras. He was just 17 years old, and one of thousands of Central American minors who made the journey alone to the U.S. A judge ordered Acosta to be deported after he missed an immigration hearing. The Department of Homeland Security says Acosta and others like him are a priority for removal because they threaten border security. But Acosta’s family says he came to the U.S. to escape violence, and if he returns to Honduras, gang members will kill him. "I miss him every day, and I worry about him every day," said Keyana Lewis, Acosta's girlfriend. She’s a junior at Riverside, and they’ve been dating for seven months. They met in a history class after Acosta spoke English well enough to switch from ESL to mainstream classes. "Before, he didn’t know English, and he said that he was looking at me, you know? Like he knew me around but he couldn’t talk to me because he didn’t know any English," Lewis said. She's tall and somewhat shy, and she's holding a sheet of paper in her hands. It's printed with large letters that read "Free Wildin." "But when he got in the class, I guess it got a little better. So we started talking, and he asked me out in Spanish," she said, smiling. Riverside Junior Keyana Lewis is Acosta's girlfriend. She says she calls him with his family at the detention center once a week. 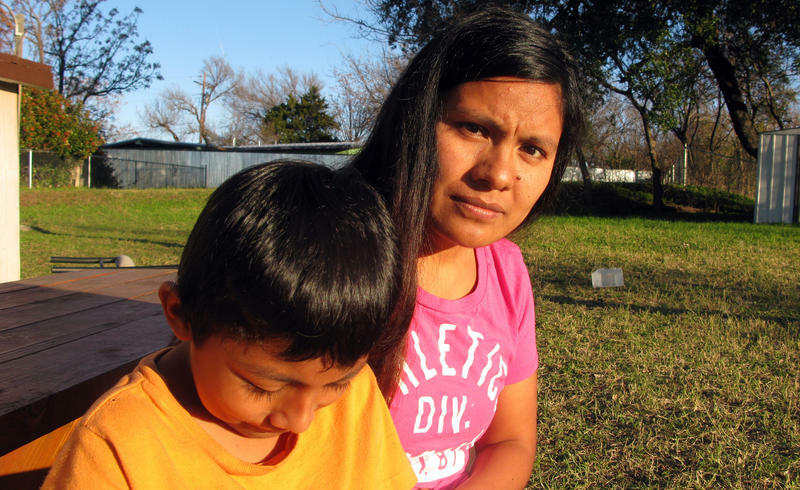 Lewis and the rest of her classmates found out Friday morning at school that Acosta might get deported this weekend. ICE officials say they won’t confirm a person’s deportation date until after it’s happened. But Acosta told his lawyer his paperwork has been processed through the consulate—usually a sign that deportation is just days away. Lewis tears up when I ask her what she’ll do if that happens. She grips the sign she's holding so tightly it begins to crumple. "I really don’t know—it’s—I dont know," she tried to say, her words failing her. "It just doesn't make sense to many students...he's a hard-working student. He has no criminal record." The students, teachers and community members marched from the church to the North Carolina Mutual Life Building where Congressman G.K Butterfield has his district office. They demanded the Congressman ask for Acosta to be released immediately. Dollie Burweln, Congressman Butterfield’s spokeswoman, came out of the building to address the crowd. "Congressman Butterfield has been in touch with Secretary Johnson as well as the director of ICE," she told the group. Burweln said Butterfield had asked the heads of federal agencies, including DHS Secretary Jeh Johnson and ICE Director Sarah Saldaña, to intervene before Acosta is deported. But late Friday night, the Congressman released a statement saying Saldaña declined to use her executive authority to change DHS's decision. Acosta's lawyers must wait until Monday morning to file a court motion that could keep Acosta in the country. But until they do, immigration officers can put Acosta on a plane back to Honduras at any time.